Singer/Songwriter Jackson Browne is one of many who lends his musical talents annually to help rebuild some of our failing infrastructure. When it comes to improving its infrastructure, America seems to be on a bridge to nowhere. One out of every nine bridges in the United States—a grand total of 66,503 bridges altogether—has been found to have one or more significant defects, according to a June report by Transportation for America. Steel Bridge Songfest is an annual, four-day music festival held in Sturgeon Bay, Wisconsin. 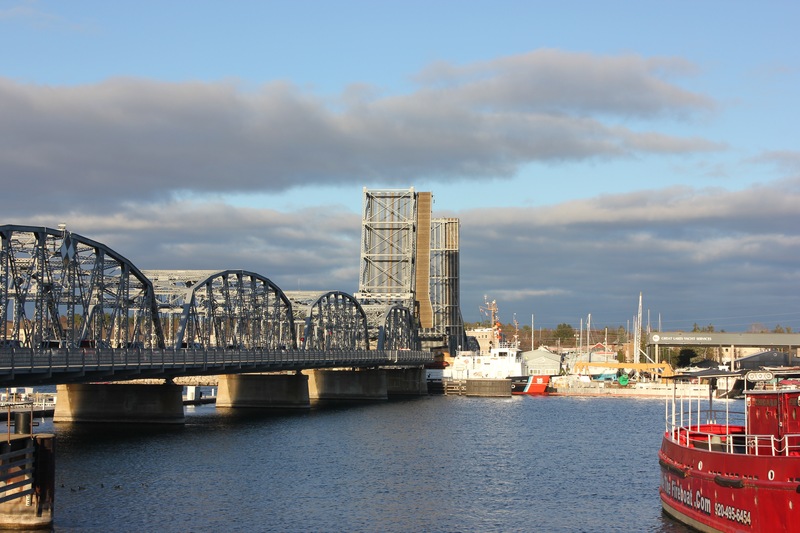 Founded in 2005 by musician Pat MacDonald and his sister, social activist Christie Weber, the event began as part of a grass-roots campaign to restore this historic bridge. The festival features a week-long collaborative songwriting workshop (called The Construction Zone) where participants write songs inspired by the bridge. The songs are recorded on-site at the Holiday Music Motel (located just up the road from where I snapped this photo) and released as compilation albums. Proceeds from album sales help fund the preservation effort. And that, folks, is how we get things done. By Cooperating, by banding together, by giving of our individual talents, time, and dedication. We’re planning a long weekend next month at the Holiday Music Motel, which Jackson Browne has part ownership in, incidentally….to enjoy the sights, sounds, and the history surrounding Sturgeon Bay. Photo by Me, Info from news reports across the www.